I am facing problem with presentation of processed products in web interface. I am processing two sites and in Product table I can see more that 150 products, but in the product part of web interface, there is only one site visible with only 22 products. 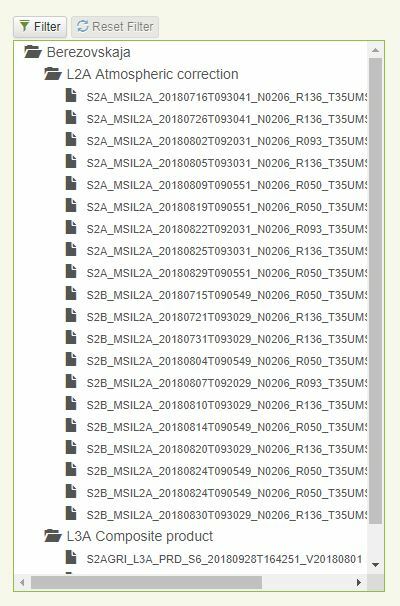 out of 56 which are in the Product table, This is problem, because I can´t start another processing on this (not visible) L2 products. Could you pls advise me what´s wrong? Can somebody answer my question please? What is the version of the system you are using? In the Product table, what is the status of the products that do not show up in the web interface? The version of the system is 1.8.3. There is no Status column in the Product table. (see attache Product table in csv). There is as well attached screenshot of the web interface, where you can see visible product. In the system, there are 3 sites, but I can see part of product just from one site with ID 6. In case of any other questions or if you need some logs don´t hesitate to conatct me. In the product table I don´t see any difference betwenn the visible and nonvisible product. please check the status of the sites in the site table. If you have 3 sites defined you should see all of them in the list. Maybe the missing sites are disabled?